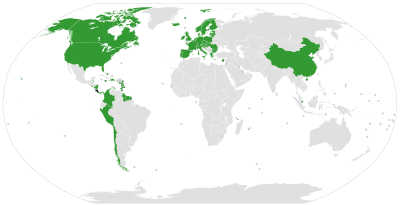 This is list of free-trade agreements between two sides, where each side could be a country (or other customs territory), a trade bloc or an informal group of countries. Note: Every customs union, common market, economic union, customs and monetary union and economic and monetary union is also a free-trade area. For fully multilateral agreements (not included below) see: List of multilateral free-trade agreements. European Union (October 1, 2013). The Eurasian Economic Union consisting of Russia, Belarus, Kazakhstan, Armenia and Kyrgyzstan has following free trade agreements, see further here. Shinzō Abe, Donald Tusk et Jean-Claude Juncker en 2017. 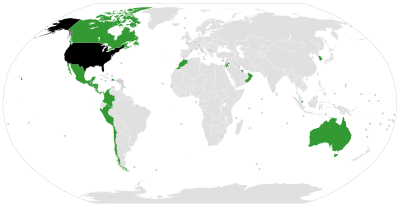 Countries with whom Georgia signed Free Trade Agreement (FTA). Countries with whom Georgia has General Schemes of Preference (GSP). The United Kingdom has bilateral agreements with the following countries and blocs. 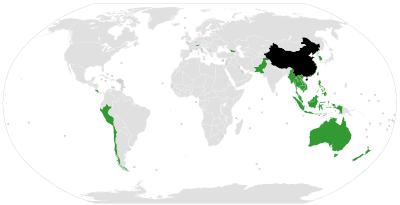 Agreements that have been negotiated and signed by the respective heads of states of each country, but not yet ratified by the country's legislative body. List of agreements in negotiation. Agreements that are so far only discussed without any formal action by the parties involved are not listed. Caribbean Community (CARICOM) - Canada to be negotiated, after Canada finishes their Central American Free Trade Agreement. Australia (Conducting feasibility study as of 19 September 2006). For an interactive list of bilateral and multilateral free trade instruments see the TREND-Analytics website. ^ "Armenia Trade Agreements". Export.gov. 6 December 2018. Retrieved 6 December 2018. ^ "EAEU Vietnam Trade Agreement". World Trade Organization. 6 December 2018. Retrieved 6 December 2018. ^ "Armenia Georgia Trade Agreement". World Trade Organization. 6 December 2018. Retrieved 6 December 2018. ^ "Armenia Ukraine Trade Agreement". World Trade Organization. 6 December 2018. Retrieved 6 December 2018. 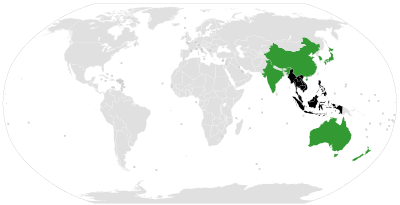 ^ "ASEAN India Free Trade Agreement 2003 Framework Agreement". Asiapedia. Dezan Shira and Associates. ^ "Entry into Force of the Japan-ASEAN Comprehensive Economic Partnership Agreement". Ministry of Foreign Affairs of Japan. 2008-12-01. ^ "ASEAN Korea Free Trade Agreement". Asiapedia. Dezan Shira and Associates. ^ "ASEAN-Australia-New Zealand Free Trade Agreement". Asiapedia. Dezan Shira and Associates. ^ "Free Trade Agreement between China and New Zealand". Asiapedia. Dezan Shira and Associates. ^ "Free Trade Agreement between China and Pakistan". Asiapedia. Dezan Shira and Associates. ^ a b "Free Trade Agreement between Switzerland and China". State Secretariat for Economic Affairs SECO. Archived from the original on 2015-01-02. ^ a b "Gulf Cooperation Council (GCC)". EFTA.int. 22 June 2015. Retrieved 4 August 2016. ^ "In Focus: EU-Canada Comprehensive Economic and Trade Agreement". ^ a b "Annual Report on the Implementation of the EU-Korea Free Trade Agreement" (PDF). Brussels. 2016-06-30. Archived (PDF) from the original on 2017-07-10. Retrieved 2018-03-24. ^ "Georgia, China sign historic Free Trade Agreement". Agenda.ge. 13 May 2017. Retrieved 14 May 2017. ^ a b "Gulf Cooperation Council-Singapore Free Trade Agreement comes into force on Sept 1". The Straits Times. 1 September 2013. Retrieved 4 August 2016. ^ "India's Trade Agreements - At a Glance". Dezan Shira and Associates. Asiapedia. ^ India, EU trade pact next spring, Economic Times, December 2010. ^ "EFTA-INDIA FTA". Archived from the original on 2011-07-26. Retrieved 2011-02-18. ^ "Malaysia-Australia trade set to take off". Investvine.com. 2013-02-23. Retrieved 2013-02-24. ^ "Mercosur signs first out of region trade accord with Israel". Mercopress. Archived from the original on 20 December 2007. Retrieved 2016-10-25. ^ "Lebanon signs Latin American free trade pact". bilaterals.org. 2014-12-18. Retrieved 2016-10-25. ^ "Mercosur signs free trade agreement with Palestinian Authority". MercoPress. 2011-12-21. Retrieved 2016-10-25. ^ "EU-Singapore Free Trade Agreement (Full Text)". Asiapedia. Dezan Shira and Associates. ^ a b "Chile seeks investment in Thailand". Investvine.com. 2013-02-27. Retrieved 2013-04-04. ^ "China-Asean Trade Deal Begins Today". Jakarta Globe. 1 January 2010. Archived from the original on 17 January 2010. Retrieved 1 January 2010. ^ Chan, Fiona (31 December 2009). "Asean-China FTA to kick off". The Straits Times. Retrieved 1 January 2010. ^ "Colombia/Canada launch FTA promoting agro-trade and mining investment". 18 August 2011. Retrieved 18 August 2011. ^ Porter, Barry; Manirajan Ramasamy (26 October 2009). "Malaysia, New Zealand Sign Free Trade Agreement to Bolster Ties". Bloomberg News. Retrieved 2009-11-05. ^ "EU approves free-trade talks with Canada". The Globe and Mail. Toronto. Archived from the original on 2009-04-30. Retrieved 12 August 2013. ^ a b "^ EU, Singapore ink free trade agreement". Investvine.com. 19 December 2013. Retrieved 17 January 2013. ^ "Cooperation across the snows". Retrieved 2018-08-14. ^ a b Kerr, Peter (2009-11-03). "Gulf states to sign free-trade agreement with NZ". Business Wire. Retrieved 2009-11-03. ^ "NZ-India trade doors could open". One News. 22 February 2009. Retrieved 15 October 2011. Bilaterals.org, an activist group that works to oppose bilateral arrangements "that are opening countries to the deepest forms of penetration by transnational corporations"